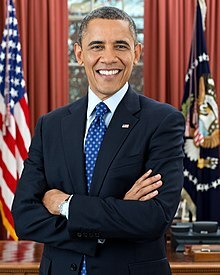 Barack Hussein Obama II (born 4 August 1961 in Honolulu, Hawaii, Unitit States) is an auld Preses o the Unitit States. He wis electit Preses o the Unitit States o Americae in 2008. He assumed affice oan 20 Januar 2009. He is the first African American tae haud the affice. Obama afore served as a Unitit States Senator frae Illinois, frae Januar 2005 till he dimitit efter his election tae the presncy in November 2008. Obama wis electit Preses for a seicont time in November 2012. He servit until 20th Januar 2017 afore bein succeedit bi Donald Trump. Obama is a graduate o Columbia University an Harvard Law Schuil, whaur he wis the preses o the Harvard Law Review. He wis a comity organiser in Chicago afore earnin his law gree. He wirked as a ceevil richts lawer in Chicago an taucht constitutional law at the University o Chicago Law Schuil frae 1992 tae 2004. Wikimedia Commons haes media relatit tae Barack Obama. This page wis last eeditit on 11 Februar 2019, at 11:19.